Montjuïic is perfect for a leafy stroll with great views, but hard to reach so i s less populated by tourists. Scattered across the landward side are buildings from the 1992 Olympic Games, including Santiago Calatrava's Olympic needle, while facing the sea is the lighthouse and vast cemetery. 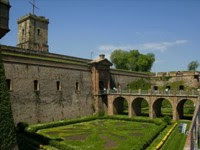 The Castell de Montjuïc was the burial place for the medieval Jewish community. Energetic visitors can climb to the top of the hill, which is just a short distance from the Olympic stadium and Jardi Botànic. The Plaça Espanya provides the most popular access to the park. Here, you can visit the Pavelló Mies van der Rohe, the Museu Nacional d'Art de Catalunya and cultural centre CaixaForum. In Barcelona, a walk in the park is not just a relaxing experience but an artist ic journey as well. Stroll round the leafy gardens of the Teatre Grec and then head to the Fundació Joan Miró, one of the greatest museums in the world. 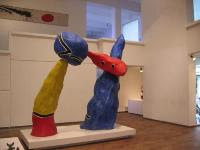 It's home to a collection of over 225 paintings, 150 sculptures and graphic pieces by the Spanish surrealist artist, along with a number of works by his contemporaries. Wander over to the Jardins Laribal, meticulously designed by the French landscape artist Jean-Claude Nicolas Forestier. Don't miss the Tres Pins nursery, where plants are grown for the city's municipal parks and gardens, or forget to tip your hat to the bronze statue of the Italian poet Dante Alighieri in the Plaça de Dante. Like Paris, Barcelona has a literary flavour. In this city, many writers have been inspired by the lower Raval, generally referred to as the Barrio Chino, a name coined by an American journalist due to its underworld feel in the 1920s. Haunted by drifters and prostitutes, the seedy ghetto forms a strangely glamorous setting for Jean Genet's existential novel The Thief's Journal (1949) and provides the backdrop for the civil war novel The Palace (1962) by Nobel prize-winner Claude Simon and The Margin by André Pieyre de Mandiargues (1967), which was made into a film. You can browse through books at the cosy bar of Café de les Delicies and catch a poetry reading at The Quiet Man. Barcelona is a picturesque place, so even if you're new to the art of photograp hy, the city still manages to look good. Some scenes, of course, are more photogenic than others. To spot a few, wander through Almacenes del Pilar. Here, you'll find a glorious array of fabrics and accessories for traditional Spanish costumes on display in a Bohemian interior dating back to 1886. For mouth-watering photographs, head to the city's most central food market and gourmand's pilgrimage La Boqueria along La Rambla, where you'll discover layers of fruit and veg, olives and herbs in full colour. For a bird's eye view, ascend the Torre de Collserola, Norman Foster's galactic communications tower. No one leaves Barcelona without sucking on an oyster. The city toasts the fine Galician restaurant Botafumeiro in Gràcia for its fantastic assortment of seafood, served by impeccably dressed waiters against a backdrop of nautical motifs. 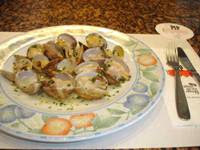 Cal Pep in the Born is known for its trifásico, a mélange of fried whitebait, squid rings and shrimps, and exquisite little tallarines (wedge clams). The Barceloneta restaurant Can Ramonet displays a spectacular haul of fresh seafood every day, which is likely to tempt you if you're piscatorially inclined.